Everyone has those moments when they want to write something, but can’t seem to find anything in the world to write about. It happened to me when I wanted to write this blog post. I ended up logging into my LinkedIn account and upon arriving at the home page I remembered some of the better resources for developing content creation ideas, LinkedIn Today and Mashable Follow. LinkedIn Today is LinkedIn’s version of a social news platform and it’s generated directly from the network you’re connected to, which helps bring you the most relevant news about the industries and topics you care about. Mashable Follow is Mashable’s version of a social network that allows you to choose which stories and activities of certain people you would like to follow. The best thing about both of these services is that they act as a means to filter the content that you find the most important right to one place. Many people choose one over the other to get their news based on their interests, but nevertheless, the fact that both services are catered to your needs is what makes them powerful resources. There are thousands of news sources out there, but only so much time in the day. Specifying what you want to see is key to getting the most use of these services. LinkedIn Today offers you the content shared by over 100 million members of LinkedIn, based specifically off of the professional connections to your account, alongside the industries and sources you wish to follow. Begin by logging into your LinkedIn account and then visiting LinkedIn Today. You’ll see that you’ve already have a sleuth of headlines at your disposal. These are based off the content your connections and your connection’s connections have shared on LinkedIn. These articles are pretty relevant to you as a user, but for the complete experience begin by following industries and sources you find most valuable to your needs. 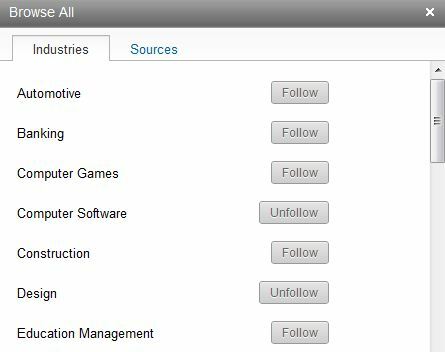 Now go to the top right hand corner of the LinkedIn Today home page and click the little grey arrow, circled here in red. 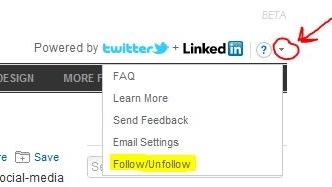 This lowers a drop down menu and shows you a few options, click Follow/Unfollow. This will give you many industries to choose from such as Design, Construction, Banking and more. Choose which you’d like to follow or unfollow, repeating the same thing for the sources section. This section contains many online media outlets like Mashable, AdAge, the BBC and more. After selecting the areas you’re most interested in your work is done for now, giving you the most relevant news about what you actually care about. Millions of people read Mashable every day as their #1 news source for all things social, tech and web related. One thing many don’t know is that Mashable Follow is Mashable’s version of a social network that helps filter content based on what you specify. To begin specifying what content interests you the most, create an account with Mashable. You can simply log in with your Twitter or Facebook account to set up your Mashable account. Now from here, you begin to fill out information in your profile and connect your other social networks to this account, however, this isn’t necessary. Now go to the top of the menu bar and click on either People or Topics to begin following who or what concerns you. Once you’ve began following topics like Facebook or Social Media and people like Pete Cashmore or Ben Parr, you’ll begin to receive updates at the top of your screen under My Stories and Activity. What does this mean? You can still browse through Mashable as you would regularly, but now with an added relevance to what you care about most. If you look under My Stories there will be a propagated list of articles based upon the topics you chose to follow. Under the Activity tab you can begin to view the activities of the people you chose to follow, like their comments on articles or the articles they shared on their social networks. This gives you a wide variety of articles to read and browse based on who you trust and what industries relate to you. It’s like the Facebook news feed but filled with only articles you’re concerned about. Product Updates: You’ll be one of the first to learn about the latest and greatest product updates and releases as they pertain to you in Mashable Follow and LinkedIn Today. With this knowledge of a new iPad or Zynga release, you could write a blog or article about a currently unexplored aspect of the new product. Many articles are released about the various features and uses of a new product, like Google+ for instance. Taking an existing story about a product and giving it a spin of your own is a great way to garner the same level of interest the original article achieved. Company Innovations: Just like the amount of news there is available to absorb in one day, the number of companies with important developments is expanding each and every day. Start by looking at companies with the biggest market share and multiple mentions on both platforms. By following certain people in Mashable Follow, you can see which companies are generating the most buzz by the people you trust. See what one of your favorite companies is accomplishing and write about how it will affect the entire industry, your company or the way we think about a particular product or service. Mashable Follow allows you to follow certain high profile companies, stay updated on their progress to see what information you can pull from them in the future. ‘How To’ Ideas: Similar to taking your own spin on a company or product innovation, looking at an existing ‘how to’ article can help spur ideas for your own version of these step by step guides. While using LinkedIn Today, I discovered this ‘how to’ guide for 5 Terrifically Brilliant Uses of Tumblr, from here you could begin to think of ‘how to’s based on the pros and cons of different blogging platforms, how to decide between WordPress or Tumblr, how to misuse a Tumblr, etc. Finding Photos, Images & Infographics: Mashable Follow’s topics sections are wonderful for discovering professional and user-submitted images, alongside infographics. Find these various types of imagery and write an article about them. For instance, an infographic about the history of mobile use is a wonderful example of an image you can write a lengthy blog post about. You could even troll both custom news sources to find a series of images from a variety of sources and come up with your own top ten list, the opportunities are endless. Developments in Pop Culture: Lastly, look how different innovations in pop culture affect your industry or interests. Take a different approach to a movie release’s social media campaign or how news in the entertainment world can be spun to have more practical uses. There’s a lot of opportunities here as well, as long as you look at what people you value are sharing and make it your own.